It's good to be back out at a track again. With the long winter of working on the cars, waiting for our trailer (which still isn't in), and dealing with stupid cold and just plain awful weather, being back at the track nice. We ran 3 bracket races down at Atco, NJ this weekend. Friday was a 5K race, the first race on Saturday was a 10K, and Saturday's second race was their regular points race (2K). Friday was the best day of the weekend. Made 9 laps (4 time trials and 5 rounds). All in all, I made 15 laps this weekend. 1st round (6:27 PM) I raced Jackie Biondo was .018 to her .025 and was dead on with a 1 with a tap of the brakes at the stripe. She dumped to 1 over giving me .022 stripe (I was only going to take about .010). Second round (8:50 PM) I raced some stretched out 23 T altered. I was .002 to his .027 and still wasn't getting there. I swapped feet and went 7.863 on a 7.85 at only 161 MPH and he was a 5-under 8.27 on a 8.32. I was probably on a 7.842 so he was getting there first by .017 and I fed him an extra .02 for good measure putting him there first by .037. Third round (10:18 PM) I raced a doorcar dialing in at 9.84 to my 7.83. By now it's 45 degrees outside. He's .017 to my .021 (I rolled a little too much into the box after the .002 the round before to be safe). Get down to the other end and I'm going to get there by probably a hun, then he gets on the brakes. So I jump on the brakes and cut it to .003, 7.849 to 9.866. 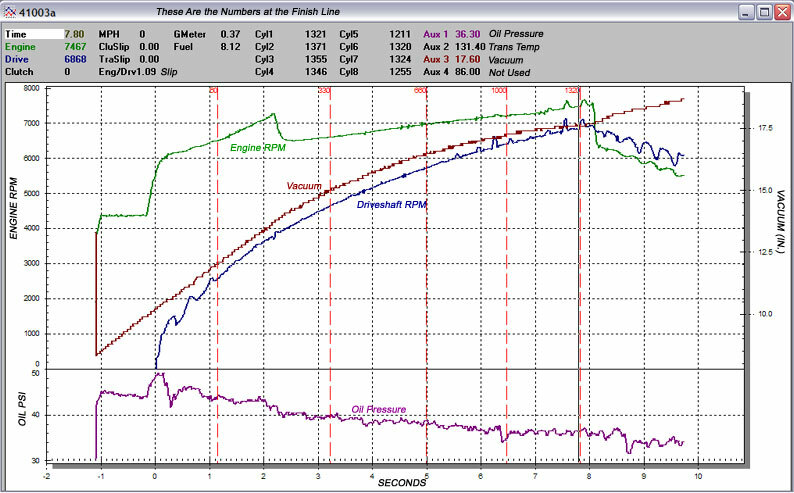 Fourth round (10:37 PM) I raced a dragster dialed in at 7.44 to my 7.82. I'm .016 to his .032 ride the brake at the end and slow to a dead on 7.824 at 168 (killed about 5 MPH). I took .017 stripe and he was 7.445 at 179 dumping me. 44 degrees out. Fifth round (10:57 PM) I had another dragster dialed 7.44 to my 7.81. I was .019 and he was .001 so I was all done right there. He caught me, womped me so I dumped hard hoping he was under, but he was 7.456 to my 7.822 @ 165. I fed him an extra hun, but he had killed enough already. From what I figure, my run Friday night was a 7.807 before I dumped. (12:22 PM) After running 7.827 on my second time run at 173.03 I dialed 7.83 for first round. I ended up running Frank Mark who was dialed in at 7.31 in his dragster. I grabbed .005 off the line (.008 to .013) and up the big end got on the brakes at 7.5 seconds to cut him to .0029 - 7.842 @ 169 to 7.319 @ 183.67. I was on a 7.835. Second round (1:15 PM) I'm running a dragster that's dialed heads-up with me, 7.83. Now looking at this, I know that my car is off about .04 to .05 in 60' from everyone else and then I run real strong on the top end for speed. So despite the heads-up dial, I'm figure that I'm probably chasing. I hit the tree better (.004 to .011) and I knew it going by the tree. Must be all that heads up racing paying off. Then, sure enough, he pulled ahead with a 1.11 60' to my 1.15. He pulled away further at the 330 and was now .03 in front. He was still .03 in front at the 1/8th but I had a little over 1 MPH on him there and by the time we got to the 1000', I was in front by .001 (6.478 to 6.472). I gave it about 3 womps to tighten it up to .010, then he dumped and fed me a hun and I ended up taking .020 going 7.845 @ 166.19 to his 7.858 @ 163. Boy those 4-link cars can stop quick on the top end with less worries of locking the brakes up. Third round (3:37 PM) I raced Jamie Saracco in his beautiful new Miller dragster. I was dialed 7.83 to his 7.37. We were close on the tree, .006 to his .009, but my car spun a bit when it shifted (the sun had been out for a while), and all I would've had for him was a 7.850. He rolled up next to me and I put it in park, but he was a one-over 7.383 to my 7.855 and that was it for me in the 10K. I sat around for a while and at 6:23 PM Got to run first round of the points race. I pull a dragster dialed 7.26 to my 7.85. I kill him on the tree .011 to .040 and start looking over a couple hundred feet out to make sure he's not broken. Just as I start to see his front wheels, the car hits the chip (7700) so I lifted and tossed it in second. The car never shifted. By my 330' number I was looking like I was going to be pretty close to dead-on, too. Come to find out, the Regulator on the CO2 bottle had loosened up and bled all the CO2 out of it. The bottle is mounted up in front of the foot box under the panels so I had no way of knowing until it was too late. Guess that's just one more thing that I'll have to check in the morning. It was super tight when we left to come down here and only lasted 14 passes. Maybe the fact that I was using a new washer in there had something to do with it. At any rate, it won't happen again. That pretty much ended the weekend for me as Sunday was a washout. It actually wasn't raining when they called it, but it had earlier in the morning and looked like it was getting ready to again at any moment. One thing I did discover this weekend is that I need a different converter. I'm running the speed of a low 7.70, high 7.60 car, but I'm 60'ing like an 8.10 car. I'm giving up about .05 to the 60' and almost .100 to the 1/8th mile to cars running the same speed as me. Most of the guys in the Dan Page cars are running this B&M Converter that works real good so probably the next time I have about $950 I feel like parting with I'll pick one of those up. I want to run my car on the stop the way it is first to see how it cuts a light and see how it MPH's so I'll have some basis of comparison from a Super Comp perspective, too. My ATI in the car now is slipping 9% on the finish line so there's probably a little more MPH in there, too. I also have my Select on the shelf that Eddie just freshened up so I could try that one, too. It's just so much fun to change a converter in the car though, having to either slide the motor forward or take the rear end out (which I'll probably end up doing because the mandrel on the crank is too close to the radiator in the front to slide it forward now). What we did to the car this winter definitely picked it up, though. Looking at my data from when I was here in the fall, I went 7.901 @ 169.72 with an adjusted altitude of 40 feet and a Barometer of 30.31. On my fastest past this weekend, the air was about 85 feet (.003 slower) but had a lower barometer of 29.89. and the car ran 7.815 @ 173.05. So factor the air and that's a 7.812. Realistically we picked the car up a tenth and about 3.25 MPH. What we changed was putting the Vacuum pump on there, Putting a Super Sucker under the carb, and used a different hoodscoop/airpan. We also put a Digital 7 in there, but that shouldn't affect the performance. The other thing we did was add 30 lbs to the nose, plus the weight of the vacuum pump. I lost some weight, but the car still has to be up 20 lbs from last year from what we added to it. I'll have to scale it out and see what it actually weighs, but I'm thinking it's pretty close to 2000 lbs right now. Of course that's with about 100 lbs in the nose, too. So the car's actually about a tenth faster than I'm going because of the weight, but if I take it out, then it goes into mega-wheelie and yanks the wheels out of the beams which slows the ET anyway. Such is life. The other good news is that with the extra weight in the nose, the car's not jumping around .03 in reaction time like it was in October. That really bothered me all winter. My lights this weekend were .028, .018, .010, -.005, .018, .002, .021, .016, .019 on Friday and .007, .003, .008, .004, .006, .011 on Saturday. If I made the delay the same for all my runs this weekend (like where I ended up with it on Saturday), my lights would've been: .013, .013, .015, .002, .018, .002, .018, .013, .016, .007, .003, .006, .004, .006, .011. As it was, my worst light of the weekend over 15 passes was a .028, and that was the first hit of the year and because I had .015 too much in the box (didn't know how much I'd need with the LED's) and the 1 red light was because I had .007 too little in the box still trying to feel the LED's out. Another thing that may have helped out with the RT's was the new blower I had put on the helmet this winter by F.A.S.T. Last year when I ran at night here my shield was just plain fogged up. Even when it was cold during the day, one wrong breath and I was looking through fog. Not this time. Friday night my shield was fogged up until I turned the blower on every pass. With NHRA's new mandate of leaving with the shield down (which isn't really enforced at Bracket Races) it was nice to be able to put the shield down after Prestaging and not have to hold my breath or worry about looking through a fogged up shield after I let go and put it down. So all in all it was a successful weekend, even though it ended with kind of a bum note with the car not shifting. All I could do was laugh about that, though. I spent $387 in entry fees between the three races and made back $325 of it, so that was pretty good - much better than most. So that's it for this update... Hopefully the weather will be as good next weekend for the Open at Atco as it was Friday and Saturday here this weekend. Let's see how fast those Camaros will go!